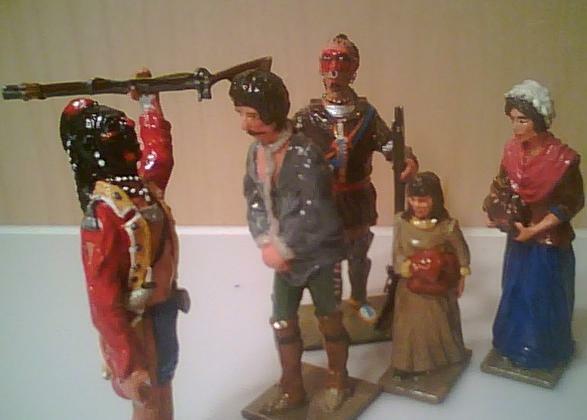 First we have the Abraham in Arms: War and Gender in Colonial New England (University of Pennsylvania, 2007) collection. I love these little figures, a gift from my husband. 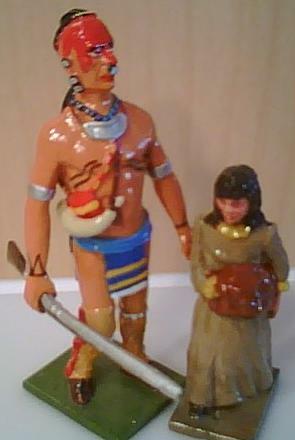 They represent a captive Anglo-American family (man, woman, and girl child) with two warriors. So much fun to pose on my bookshelves! Then we have The Many Captivities of Esther Wheelwright (Yale University Press, forthcoming, 2016) doll, also a gift from my husband. There is no link yet for this book yet–you’ll just have to trust me. However, I signed the contract this spring, and I just cashed the check for the first 1/3 of my advance a few weeks ago! Love, love, love that your books have doll collections. And congratulations on finding such a good home for Esther’s story. Can’t wait for 2016! I know, yet ANOTHER reason next year is going to be Teh Awesome! I’d like to have my dolls play together, but they’re wildly different sizes–from about 2 inches to 8 inches to 11.5 inches. I don’t think it will work. I have a Zorro doll, but you wouldn’t believe how hard it is to find Diego de la Vega outfits! Didn’t he twirl around to transform into Zorro? (Or am I thinking of that other fabulous superhero alter-ego, Diana Prince?) In any case, you want to do the reverse, that is, turn your Zorro into D de la V, so probably not a very helpful idea. I clicked on the ??? picture to enlarge it, and even used a handy magnifying glass that I keep by me for recalcitrant documents (or for my own scrawled research notes, actually), but no definitive guesses for “what’s next” yet. Those are nicely-articulated forearms on the third doll, though. Will the winner be entered in a contest to win an IPad, or anything? Does this third project take you to Angleterre? I have a Phyllis Wheatley doll in my office at work. When I teach her poems, she comes to class with me and informs the students that she is the smartest person in the room. They have no choice but to agree. WANT THIS!!! Where did you find her? Cool! Is she a magnet? I’ve got an Eleanor Roosevelt and a Sojourner Truth who look like they’re made the same way, only they’re magnets on my fridge. Because feminism is a household word chez nous! 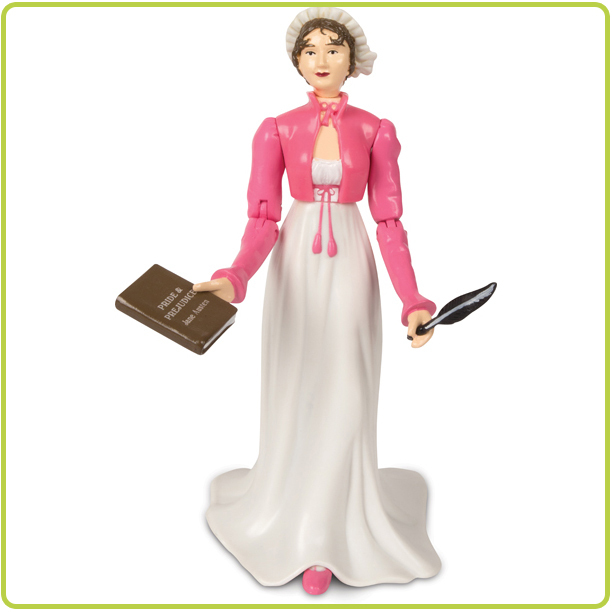 I’ve always wanted that Jane Austen action figure. Are you going to look at undergarments in Pride and Prejudice? Jane Austen rocks! I have two office dolls, a Mary, Queen of Scots, gifted from a student and, from my dear husband, a Starbuck from Battlestar Galactica (2003) who can swap out her cigar for a hand of cards or a pistol.